Mizoram's population was 1,091,014, according to a 2011 census. It is the 2nd least populous state in the country. Mizoram covers an area of approximately 21,087 square kilometres. About 91% of the state is forested. 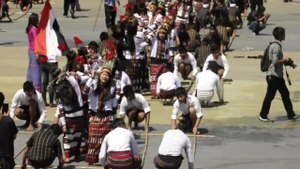 In 1971, the government agreed to convert the Mizo Hills into a Union Territory, which came into being as Mizoram in 1972. Following the Mizoram Peace Accord (1986) between the Government and the MNF, Mizoram was declared a full-fledged state of India in 1987. Mizoram was given two seats in the Parliament, one each in the Lok Sabha and in the Rajya Sabha. The region has been peaceful in recent decades. Between 2006 and 2013, no more than two civilians have died each year from protest-related violence (or less than 0.2 people per 1,00,000). The world's average annual death rate from intentional violence, in recent years, has been 7.9 per 1,00,000 people.